One of our most popular crosswords is the Sports themed Crosswords. Our sports crosswords can cover a range of sports, such as football, golf, tennis, cricket, athletics, badminton, rugby, hockey, snooker, horse racing, motor racing, or be specific to just one or two sports. We supply our themed sports crossword puzzles in PDF or EPS format, which you can then use and manipulate as you wish in your publication. If you would like to purchase sports themed crosswords for publication, please Contact Us with your requirements. 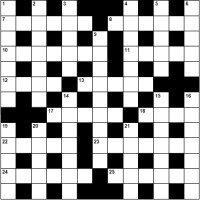 For instance let us know whether you require any particular size of puzzle, a generic sport crossword or a specific theme: e.g. football, cricket, tennis, golf, rugby etc.